The Illinois General Assembly completed its two-week veto session this week and is adjourned until it returns in the "lame-duck" session on January 7-8. The new 101st General Assembly will be sworn in on Wednesday, January 9, 2019. The newly elected governor will be inaugurated on Monday, January 14, 2019. Neither SB 2892 (Manar, D-Bunker Hill), which would have phased-in a minimum teacher salary of $40,000; nor SB 2572 (Holmes, D-Aurora), which would have required all students to have 150 minutes of Physical Education per week, were considered before adjournment. Both bills were vetoed by the governor and no motion to override the veto was called for a vote, thus killing those bills for this session. Both bills will likely be reintroduced in January for the 101st General Assembly to consider. The strong response by Alliance members regarding the impact of these two measures were largely responsible for stalling the bills this fall. Click here to read the entire Alliance Legislative Report 100-80, including other legislative action taken during veto session and appointments made by Governor-elect Pritzker to the Educational Success Committee. The IASB Board of Directors held its annual reorganizational meeting on Sunday, November 18 to make committee assignments and welcome a new Service Associates chairman. President Joanne Osmond, a member of the Lake Villa CCSD 41 Board of Education, and Vice President Thomas Neeley, of the Morton CUSD 709 Board of Education, were both elected to serve second terms by the IASB delegate assembly. The board approved directors Mark Christ, O'Fallon THSD 203; Dennis Inboden, Robinson CUSD 2; Sue McCance, CUSD 3 Fulton Co.; and Sheila Nelson, Cairo SD 1, to serve on the Nominating Committee chaired by Immediate Past President Phil Pritzker, Wheeling CCSD 21. Alternates are Ann Dingman, Grayslake CHSD 127, and John Metzger, Benton CCSD 47. Directors elected to join Osmond, Neeley, Pritzker, and Treasurer Linda Eades, Northwestern CUSD 2, on the Executive Committee include Mark Christ; Rob Rodewald, Bourbonnais SD 53; Simon Kampwerth, Jr., Peru ESD 124; McCance, and alternate Michelle Skinlo, Mattoon CUSD 2. Neeley will chair a new Policy Review Committee that will review and recommend proposed changes to the IASB Constitution and board governance policies. It will also review NSBA resolutions. Other appointments included the Audit Committee, 2019 Conference co-chairs, an IHSA representative, and 2020 NSBA delegates. The board also welcomed a new chairman of the IASB Service Associates. Jason Vogelbaugh, director of energy solutions for Alpha Controls & Services, replaces Glen Eriksson, who served two terms as chairman. Vogelbaugh will serve a two-year term. The IASB Board of Directors consists of elective officers and 21 regional directors who were elected by school board members in their areas. The chairman of the IASB Service Associates and the IASB executive director are ex-officio members. The next meeting of the Board of Directors is scheduled for March 1-2, 2019, in Lisle. School districts in Illinois now have maximum flexibility to define instructional days based on what will improve outcomes for students. The Illinois State Board of Education will host a series of public Q&A events for educators, parents, families, and school and district leaders to ask questions and share successes and challenges in using this flexibility afforded in state law. Public Act 100-0465, also known as the Evidence-Based Funding for Student Success Act, made sweeping changes to education funding in Illinois when it became law on August 31, 2017. The law changed the basis of state funding to student enrollment, rather than attendance. The act removed Section 18-8.05 of the School Code, which had defined a day of attendance as a minimum of five instructional hours. Funding schools on enrollment provides school districts the resources and flexibility to support all students, especially the students most in need of support to access educational opportunities. ISBE released guidance, available in the Definition of an Instructional Day memo, on November 9 to assist school districts in using this flexibility. The Department of Homeland Security (DHS) Campus Resilience Program has made available starter kits for school districts to conduct active shooter drills and exercises. The kits come at no cost and contain a set of scalable tools to test existing emergency plans, protocols, and procedures. Each is designed to strengthen preparedness, response, and recovery capabilities. 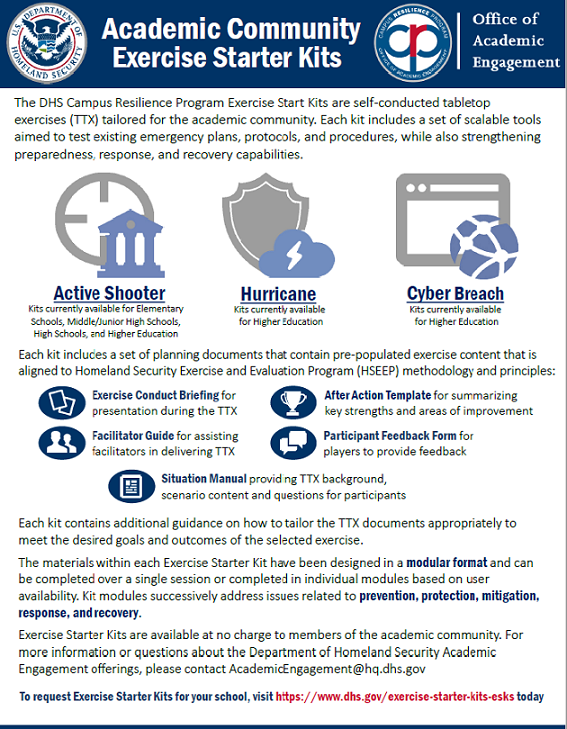 Within the starter kit schools will find pre-populated exercise content that includes a conduct briefing for the tabletop exercise, a facilitator guide, a situation manual which provides the scenario content and questions for participants, an after action template, and a participant feedback form. IASB has a number of resources available for school districts looking for additional information on school safety procedures. The school safety and security page on the IASB website includes materials on school safety procedures, best practices, and other recommendations and tips. The free active shooter kits are available for elementary, middle/junior high schools, high schools, and higher education institutions by visiting https://www.dhs.gov/exercise-starter-kits-esks. 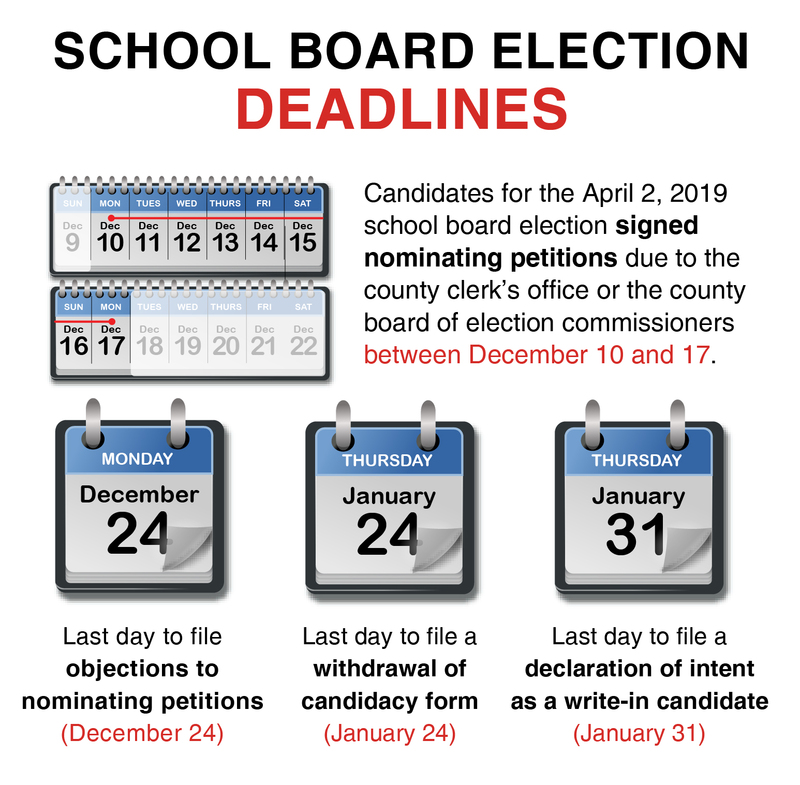 their signed nominating petitions to the county clerk’s office or the county board of election commissioners between December 10 and 17, the Illinois State Board of Elections says. Nominating petitions (either form P-7 or P-7a) must be signed by at least 50 qualified voters who live in the district, or 10 percent of the qualified voters who live in the district, whichever is less. 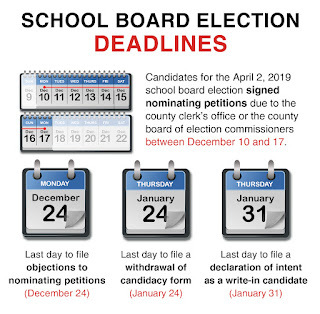 Other dates regarding school board elections include the last date to file objections to nominating petitions (December 24), last date to file a withdrawal of candidacy form (January 24), and last date to file a declaration of intent as a write-in candidate (January 31). IASB offers further election information and candidate guidance on its public website. Last week the Illinois General Assembly convened for the first week of the two-week Veto Session. During the majority of the first three years of Governor Bruce Rauner's administration, veto overrides were few and far between as legislators in his Republican party were reluctant to vote against the sitting Governor. With Governor-elect J.B. Pritzker defeating Rauner for the top executive office in Illinois in the recent General Election, members of the Governor's party did not hesitate to join the Democrat majority in overriding the veto of dozens of bills. However, while many veto actions were overridden in their original chamber during the first week of Veto Session, two important issues that the Alliance was interested in were not called for a vote on the override motions. One of the most controversial bills from the spring legislative session was Senate Bill 2892 (Manar, D-Bunker Hill), which would have phased-in a minimum teacher salary of $40,000 over the next few years. Another overly prescriptive mandate, SB 2572 (Holmes, D-Aurora), would have required all students to have 150 minutes of Physical Education a week. While there is reason to be optimistic about defeating these two measures, they could still be called during the second week of veto session next week. If these issues are not addressed in the Veto Session, the Alliance expects both to be an issue in the next General Assembly. HB 1262 (Currie, D-Chicago) provides that a School Code mandate waiver request regarding tax rates, funds, or transfers shall not be reviewed by the panel of General Assembly members, but shall be submitted to the full General Assembly for consideration. HB 4284 (Chapa LaVia, D-Aurora), a Vision 20/20 initiative, would require at least three members of the Illinois State Board of Education (ISBE) to be from the educator community, defined as a teacher, principal, superintendent or school business official. HB 4657 (Manley, D-Joliet) creates the Emotional Intelligence Education Task Force to develop curriculum guidelines and best practices on emotional intelligence and social-emotional learning. HB 4743 (Ford, D-Chicago) disallows any employer from discriminating between employees by paying wages to an African-American employee at a rate less than another employee who is not African-American for the same or substantially similar work on a job that requires equal skill, effort and responsibility. HB 5175 (Hoffman, D-Belleville) repeals the authority of the Charter School Commission to act on appeals to overturn a local school board's decision regarding Charter Schools. Now, initial decisions of a local school board are subject to judicial review under the Administrative Review Act. HB 5195 (Greenwood, D-E. St. Louis) allows school boards to provide free transportation for any pupil residing within 1 1/2 miles from the school attended where conditions are such that walking, either to or from the school to which a pupil is assigned for attendance or to or from a pick-up point or bus stop, constitutes a serious hazard to the safety of the pupil due to a course or pattern of criminal activity. The following vetoed bills were overridden in the Senate and will be considered in the House next week. SB 2332 (Morrison, D-Deerfield) raises the age from 18 to 21 years for any person to legally purchase tobacco products, electronic cigarettes, and alternative nicotine products. SB 2345 (Lightford, D-Westchester) requires ISBE to provide information for the school report card as to whether or not a school has participated in the Illinois Youth Survey. The following vetoed bill was called for a vote in the House to override the veto, but the motion failed. HB 3792 (Lilly, D-Chicago) would have provided that students, beginning in 6th grade, should be introduced to developing and applying work ethic in a variety of contexts. A proposed resolution calling for the Illinois Association of School Boards to support legislation that would provide local school boards the option to decide if they will allow for properly trained staff to be armed in school buildings as part of the district’s overall student safety and protection plans was not adopted by the IASB Delegate Assembly. The vote tally was 179 in favor of the adoption of the resolution, 203 against. Districts opposing the measure opined that arming staff would not create a safer environment for their students. The intent of the proposed resolution was to give local school districts the authority to decide what is best for their communities in the areas of school safety and student protection. The resolution was supported primarily by rural school districts with concerns about emergency response time and lack of financial resources to employ school resource officers. Representatives from Illinois school boards considered resolutions at IASB’s Delegate Assembly, which gives member school districts the opportunity to establish IASB’s positions on legislation and related matters of public policy. The assembly was held November 17 in conjunction with the 2018 Joint Annual Conference in Chicago. In its other resolutions action, the Delegate Assembly approved a resolution that would allow school districts to approve funds, without going to referendum, for the purchase and installation of energy-saving equipment relating to utility usage. Approved an amended belief statement on safe and secure environments, adding language to encourage state and federal investment of comprehensive mental health resources. Each resolution is originally proposed by a member district, reviewed by a 21-member Resolutions Committee, and then brought before the Delegate Assembly for any discussion and vote. The adopted resolutions set IASB’s policies and establish the legislative direction of the Association and its member districts. Click here to access a FAQ on the IASB Resolutions Process, including links to related resources. In addition to setting legislative priorities, IASB delegates re-elected the Association’s president and vice president. Joanne Osmond, a member of the Lake Villa CCSD 41 Board of Education, will serve a second term as president. Thomas Neeley, a member of the Morton CUSD 709 Board of Education, will serve another term as IASB’s vice president. Delegates also received the Association’s financial report from IASB treasurer Linda Eades of Northwestern CUSD 2 and a written annual report from IASB Executive Director Thomas Bertrand. To recognize the efforts of the nearly 6,000 school board members throughout the state, November 15 of each year is designated as School Board Members Day in Illinois. This is an opportunity for the district and community to build awareness of the role board of education members play in the decisions of local school systems. Quality leadership requires dedication and a commitment to continuous improvement. School board members work tirelessly to ensure all students are provided with the opportunity for a successful future. They volunteer their time to ensure growth and progress not only for students, but for entire communities. Thank you, Illinois school board members. Three school projects have been named 2018 Award of Distinction winners in the annual Invitational Exhibition of Educational Environments, sponsored by IASB Service Associates. 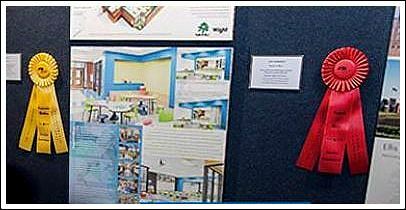 Awards go to projects displaying innovative solutions to challenges both in new school construction and facility renovations. Wight and Company earned Awards of Distinction for work on New Trier High School and Sunset Ridge School. ARCON Associates Inc. was honored for their design of Stratford Middle School. 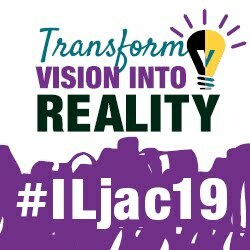 The awards will be presented at the First General Session of the Joint Annual Conference on Friday, November 16 in Chicago. Winning projects were selected by a jury pool of architects and superintendents in September. In addition to the Award of Distinction winners, the jury chose three projects for Awards of Merit and five Honorable Mention recipients. Projects selected for awards were chosen through a “blind” evaluation process. The judges considered criteria that included suitability for stated program requirements, functional relationships, aesthetics, grade level or departmental organization, compatibility with external environments, uses of new technology, and security and building orientation, among others. To be eligible, the construction had to be completed in time for occupancy with the start of the 2018-2019 school year. All of this year’s entries will be added to IASB’s School Design Database. The searchable online database contains data, illustrations, and commentary for more than 500 design entries in the annual Exhibit of Educational Environments over the past 25 years. Gerald R. Glaub, a nationally recognized leader in school board communications, who worked for 38 years at the Illinois Association of School Boards, died Thursday, November 8, 2018. He was 81. Glaub began his IASB career in 1969 as the communications department director, coming over from a communications position at the University of Illinois. He served as the head of the department throughout his long career, but also headed up the member services department for several years. Glaub served for a short time as interim executive director. He retired in May 2007 but continued as a part-time consultant. Prior to his years at IASB, Glaub worked in corporate communications in Chicago, and spent several years affiliated with higher education institutions, including time at Purdue University, and the University of Illinois at Chicago, working in university communications. He was a graduate of the University of Illinois. A memorial gathering will be held from noon until the time of a funeral service at 1 p.m. on Sunday, November 11, 2018 at Vancil-Murphy Funeral Home; in lieu of flowers, contributions may be made to: Inner City Mission of Central Illinois Foodbank.